3D printing is undoubtedly a great technology for various purposes, including making personalized toys. We can watch exciting and spectacular 3D printed toys appear every day, which are perfect for children and also adults who still love having fun. 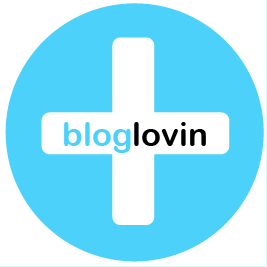 Could you ever imagine a 3D printed toy with therapeutic applications? 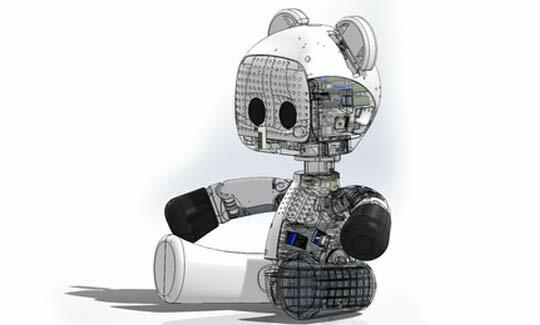 The new 3D printed teddy bear known as “huggable” by the MIT Media Lab looks pretty and charming and is also filled with sensors and electronics, with which adults can easily deal with their children. Probably it’s the most charming 3D print you’ve ever seen. It took a couple of years to produce it. In 2006 its design was introduced to nursery children in Anvoch, a town in Scotland not far from Inverness. Scientists from Highlands and Islands Enterprise (HIE) and the University of the Highlands and Islands kept up the project. Since that time MIT Media Lab’s Personal Robots Group has been working together with Jetta – a manufacturing company from China – trying to redesign the medical constituents of the Huggable. Sooyeon Jeong, one of the scientists working on the project, explained BBC that the robot operates on Android smart phone because of its sensors and computing powers, for it is easily portable and is can be easily installed. They designed the robot in such a way that it looks more child-like and can make more emotional gestures in comparison with the old versions of the robot. The teddy bear by MIT Media Lab was created as an educational, communicative and medical application. Its purpose is to improve interpersonal relationships being an audio and visual means of long-distance contact. With this Huggable it’s much easier for distant relatives to stay in touch, for teachers it provide their students with the necessary instructions. All together there are 1500 or even more sensors on the teddy’s skin; his eyes have several cameras, a mouth is its speaker and the microphones are in its ears. A PC is embedded into it that steers everything using 802.11g wireless networking. It’s so light that every child can easily lift it and hug. What’s more important, the robot was designed in such a way that it doesn’t look like a robot. Its expressions, gestures and movements convey a character of a personality, but not something robotic. The soft skin made of silicon covers the whole bear, which gives him a more lifelike appearance and prevents you from feeling technology inside. When you hold and hug it, it feels as if you hugged a puppy. 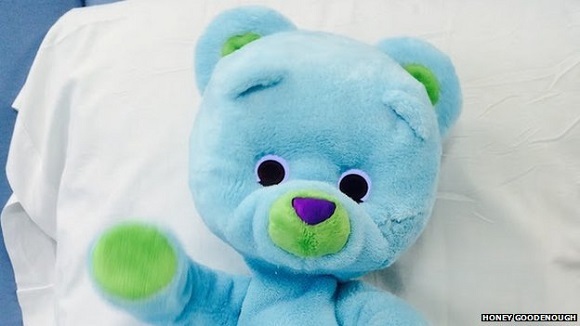 Via the internet connection the bear helps parents watch their children remotely through the toy’s eyes and talk to them using the mouth and hear them via the ears. You can also type the text, which the robot will speak and what’s more, you can even transmit commands for various emotional responses. You can enjoy your child’s facial expressions on the screen. So that’s a good way for you fully interact with your kids if you are far from them. You shouldn’t think of it as simply a webcam. It is grounded on the concept of an animal-companion and has a couple of features based on touch – the robot can recognize up to nine different types of touch like poking and tickling and there can be 6 different responses to them like punishment light, teasing pleasant and others. 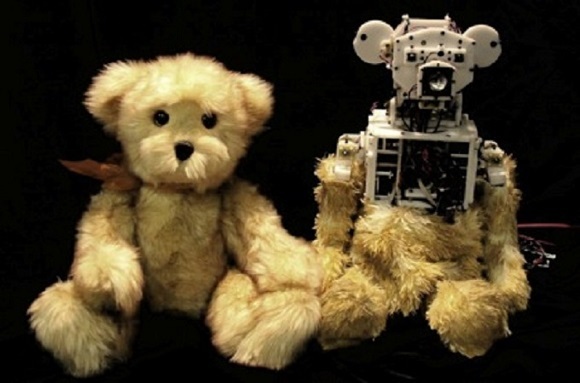 The teddy robot can remember faces of particular people and track the faces move. There’s a special joystick control option that allows users move the teddy’s head horizontally or vertically. Probably the most exciting fact is that the majority of its parts were prototypes and 3D printed. 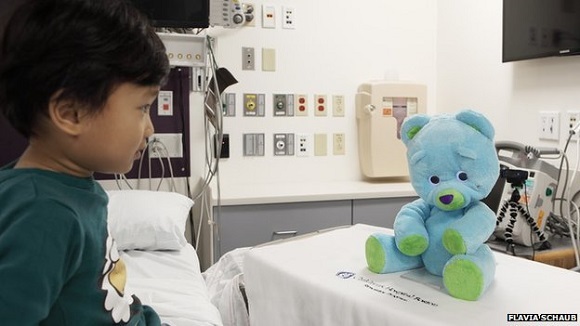 Currently the MIT team are working with patients and staff from the Medical Surgical Intensive Care Unit and the Oncology Unit at Boston Children’s Hospital trying to research the way 3D printed bears can help understand small patients better. Indeed, the toy companion is a more effective way to research how stress, anxiety and pain affect a kid’s condition than a conversation with a doctor.